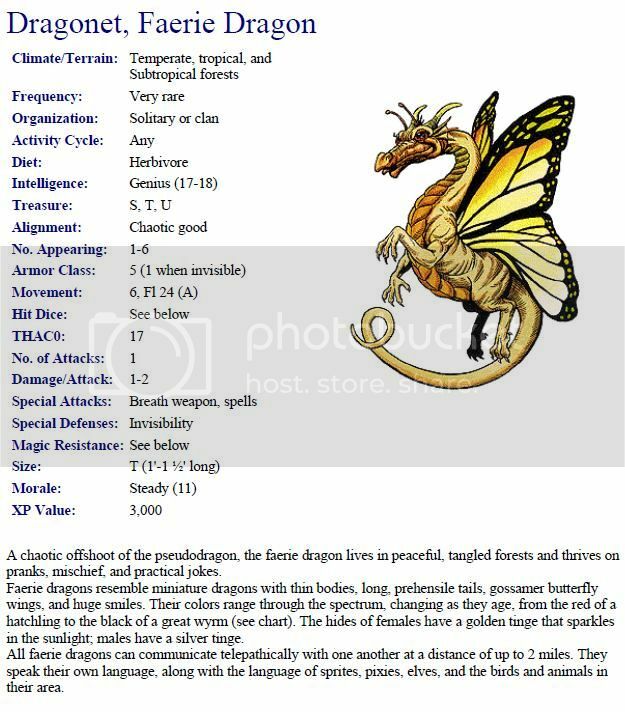 Hmmm, per 2nd Edition, the Faerie Dragons are like the size of a house Cat (1�-1 ��) in size. Below is the page from the 2nd edition Monstrous Manual. So, is this a House Rule of the DMs that they are Tinkerbell size or is there just some confusion going on here? Posted on 2013-09-03 at 00:36:54. I read that to mean they are 1 to 1 and a half INCHES long as the T stands for tiny. A house cat is not tiny trust me I have one . 1' is one inch rt?? Posted on 2013-09-03 at 01:22:53. The single ' means feet; the double " means inches. So the book says, from 1 to 1 1/2 feet long. I know it is a moot point, just trying to clarify. A house cat is Tiny for a Monster. Posted on 2013-09-03 at 01:32:25. No I appreciate it Teller, though I'm not a rules lawyer DM, I still try to follow them as close as I can without ruining the game. I'm not perfect, I do make mistakes, like the Cone. In the future if I have a question on spell size or dimensions, I'll seek you out Miss Teller if that's ok? I hate to say it but a lot of my 'spell backlash' through out the years may very well have been because I screwed up the calculations. Ok so that means I need to add her AC now to her section as she is easier to be seen and attacked as she is without her inviso power. Posted on 2013-09-03 at 04:23:27. What would we do without all our rules lawyers? Posted on 2013-09-03 at 06:24:30. You're welcome Tann, don't you worry I will be here to correct your calculations. I am not a Rules Lawyer just an Engineer. Posted on 2013-09-03 at 09:28:59. Our charcters can judge distance and area for placing area effect spells. Can you tell us the size of the room in the picture and the distance to the Bugbear? If we want to do fire or lightening we need to judge distance for best targeting and effect. Posted on 2013-09-04 at 01:36:49. Talked to Tann today, the Goblin area we see is 200 feet wide x 100 feet high and we see 200 feet deep (to behind the big Goblin Leader). So there are about 200 Goblin covering that area and starting to charge. Time to start calculating the areas effected by our spells to be sure an attack is a good idea. Posted on 2013-09-04 at 23:25:10. LET'S DO THIS! Sorry, Sorry! I get all excited when a battle is happening! Posted on 2013-09-05 at 10:48:35. Is everyone sitting down, major new player announcement here. Ok I went and asked an old friend and former Trilogy player from years back if he possibly wanted to take over Barreel. Now I love the guy to death but I was sure he would most likely say no.......... However much to my eager and delited surprise he liked the character and said yes. So you ready for this?............ Please welcome Barreel's new player Eol Fafalas! Whoo Hoo! Welcome back my friend and feel free to start posting as soon as your ready. Posted on 2013-09-05 at 16:57:14. ...it wasn't my intention to jump back into a rules-based, regularly-scheduled-posting thing just yet - I was going to just start out with a little 'free form' type stuff (maybe updating Fates of Fortune, coming up with something related and spinning off a new tale, etc) - but, then Tann sent me Barreel's info. As he expected, my initial response was going to be 'thanks but no' buuuuuuuuut I found myself reading the character sheet over and over again, last night, and the more I read it, the more I started thinking "geez, what a fun character romp this could be"... So, I cursed Tann and let him know, that, yes, dammit, I'll play this friggin' dwarf!!! Give me a day or so to read back a page or three in the game thread (you know, get my head around 'current events,' take a peek at how the character might have been played previously, blahblahblah) and I'll be right with you... Looking forward to having some Innmate interaction again. As our illustrious Trilogy Master says; GAME ON! Posted on 2013-09-05 at 17:20:11. Well there goes the neighborhood! Posted on 2013-09-05 at 18:42:26.
i dont know weather to be excited or scared...? JK i'm totally stoked! Posted on 2013-09-05 at 19:30:32. Well, let's see, I'm playing a dwarven berserker who sings while he's hacking enemies apart... I'd say scared is appropriate. Thanks for the warm welcomes, all. Posted on 2013-09-05 at 19:50:24. ...that's been messy, hasn't it? Good job, guys, even considering the cone of cold snafu. Even better, I get to jump in right in the middle of battle!!! Friggin'-squeeeeeeeeeeeeeeeeeeeeeeeeeeeeeeeeeeeeeeeeeeeeeeeeeeeeeeeeeee!!!!!!! I can foresee Barreel's song getting more verses, too... ***DEATH FROM BELOW*** LMAO! I love it! Posted on 2013-09-05 at 20:08:09.